They're not Terry's they're mine! As my friend Eminem would say, "back to reality, oh there goes gravity..." Yeah well as previously discussed in my short blogging life, we didn't get all the lovely experiences that often go with childbirth. (but what we did have was precious and special in its own right). When Joseph came home he was just under 5lb, so I decided to start exploring cloth nappies! An exercise I was planning to do in my third trimester. They could take away my vaginial, natural birth and give me a box of formula, but they can't take away my nappies! We are very fortunate in Lancashire that we have a generous, green tinged council that gives an amount of cash back towards your cloth nappies, in an attempt to help curb our massive landfill problem. I do have to admit, that my love of real nappies is only partially fuelled by environmental concerns. I just love them! They are fleecy and soft. Colourful and bright. And they look so comfy. If you had to wear a nappy, you'd want one of these, I promise! Also I was eligible, along with all pregnancy women for the healthy eating in pregnancy grant. Although in my case it was a "we hope you ate healthily in pregnancy grant!" So after shopping around on the internet, I had a nappy advisor come to the house, and she had lots of lovely options. I finally decided on a lovely green fleece set. It took a bit of tailoring to make it fit Joseph's petite derriere! Occasionally I do use disposables, for trips to clinic, and when we go away abroad, but at home Joseph is a 100% cloth. They are easy to wash, no soaking, just a 40 degree wash and a scoop of sanitiser. I don't have a washing line or a dryer, they sit happily on our maiden inside. I would urge any new mum to just give cloth a go. It's so much cheaper in the long run than disposables, your doing the earth a favour, and I believe they are more comfortable. Who said its not easy being green? Trauma and loss are common experiences for anyone who has been through a premature birth, whether your baby makes it, or sadly does not. You grieve for the birth experience you dreamt about, for your baby's first weeks, for all sorts of things. Sometimes, something stops the grieving process. Post traumatic stress disorder, to me, is like a computer virus. A worm, a trojan. The traumatised part of your conscience fragments, and it weedles its way through your brain, your memories, dragging out files and corrupting them, in an attempt to make sense of what has happened. It stops you from following your thoughts, from having insight, from making sense of what has happened, and letting go. For example, the stanza of the song I have quoted, kept coming to my mind. I haven't heard the song in well over ten years, yet it played through my head over and over again. This virus dragged up all sorts of memories, mainly traumatic ones, and linked them to Joseph's birth. I was having nightmares, nightly. It got to the stage where I was avoiding sleep because I was scared of the nightmares. I had flashbacks in supermarkets, in the park, at home, everywhere. Here I was with a baby who slept well at night, yet I was awake all night, waiting for the next drama. It wasn't until I broke down in our baby massage class that I realised I had a real problem, and it was not going away, it was getting worse. I felt so confused, as I wasn't depressed. On the good old Edinburgh scale of post natal depression, I scored low. I couldn't really comprehend what was happening. I thought, like in my song, post traumatic stress was something that happened to war veterans, not mothers of small babies. I went to my GP, and started receiving treatment. Suddenly, the world seemed a kinder place. I could finally see outside my own grief and see that of others around me. And I could see Joseph. As a bonny, growing, funny, clever little boy. And it's taken a long time, but I finally saw myself as a mummy, a good mummy doing the best she can. And finally I could let go of my little tiny translucent skinned fragile being in an incubator, and focus on the future. Meet Joseph. Lovely isn't he. Not even a bag of sugar! In this picture he weighs just 652 grams. Take a bag of sugar out of your pantry. Yes, now. Hold it, look at it, marvel at just how tiny a human can be. This picture was taken in May 2009, dreadfully hot, an early English Summer. That's me in the picture, the first time I held my darling son, at just a week old. The bruises aren't from a bar fight, they're from my friendly anaethetist. I had severe early onset pre eclampsia. Not. Fun. At. All. I've spent a good many months thinking that pre eclampsia, and the early birth of my son was the most horrendous thing that could have happened to me. I had a six month pity party. Balloons, cake and everything. Until I woke up. Joseph is the greatest thing in my life (apart from my husband of course). He is a precious gift. Ok so childbirth was not how I expected it. And I expected Joseph's first bed to be a nice cosy crib, not a cold hard incubator. But I have learnt over the past months that things could have been so much worse. Women in 21st Century England still die of pre eclampsia, babies are still lost. So my not even a bag of sugar is now many many bags of sugar! A pallett! 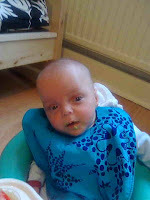 Joseph has inspired me to blog, not just about premature babies, and my experiences, but everything that touches me. Especially baking, now that takes a bag of sugar!